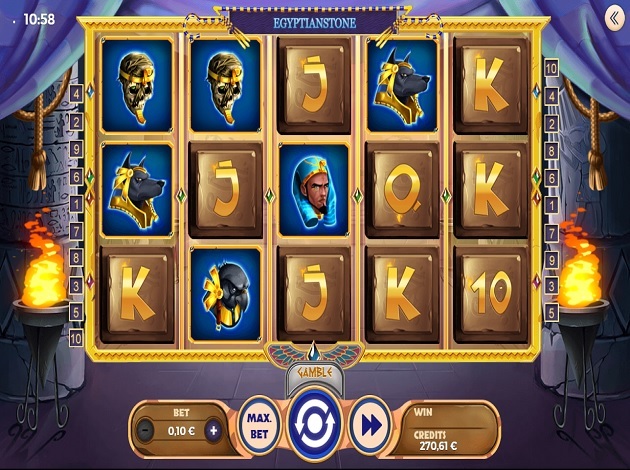 Egyptian Stone is an engaging, animated slot inspired by the history of Ancient Egypt. Developed by Spinmatic, Egyptian Stone comes with five reels, three rows, and a total of 10 fixed paylines. In Egyptian Stone, you’ll find symbols inspired by Ancient Egypt and ancient treasures, including wilds and scatters. There are also free spins, special expanding symbols, an interesting gamble feature, and more free spins within the free spins round! On the reels, you’ll see that the gods Anubis, Osiris, and King Tutankhamun have all come back to life. There is also a mummy symbol, and a sun disc symbol which acts as both a wild and a scatter symbol. The wild substitutes for all symbols to form winning combinations. Like many online slots, Egyptian Stone also comes with a gamble feature which lets you try your chances at doubling any prizes won in the base game. Unlike most online slots which come with a gamble feature, however, Egyptian Stone doesn’t offer a typical card gamble. Instead, you’re immersed even further into the secrets of the Egyptian Stone by being transported into an ancient tomb to try your luck. Your task is to try and predict whether it is Anubis or a mummy that lies in the tomb presented to you. If your guess is correct, you will double your prize and you can gamble again or collect your prize and go back to the reels. If your guess was wrong, then your win is completely lost, and you will be taken back to the base game. Three or more wild scatters landing anywhere on the reels will trigger 10 free spins with a special expanding symbol. The special expanding symbol will be randomly selected before the free spins begin, and this will not be substituted by the wild symbol. During the free spins, if there is a winning combination, the special symbol will expand to cover three positions on the reels and will then pay like a regular symbol, even if it’s not on adjacent reels! The special symbol will only expand if there are enough symbols present to create a winning combination. To make things even better, it’s also possible to win extra free spins during the free spins round. The highest paying symbols in Egyptian stone pay for two to five symbols on a line and these include all three gods and the mummy. The most valuable symbol is King Tutankhamun, paying 1x your bet for two symbols, 10x for three, and a top prize of 500x your bet for a hit of five symbols on a line. Next is Osiris, paying between 0.5x and 4x your bet for two and three symbols respectively, and 200x your bet for five symbols. Anubis and the mummy both pay bet multipliers of 0.5x and 3x for two and three symbols, and top prizes of 75x your bet. The wild symbol and the low-value playing card symbols then pay for three to five symbols on a line. The wild pays prizes ranging from 0.2x to 20x your bet, whilst the A and K symbols are worth between 0.5x and 15x your bet. Finally, the Q, J, and 10 symbols pay up to 10x your bet. Egyptian Stone takes you deep inside an ancient tomb where the gods of Ancient Egypt lie buried along with mummies and famous kings. On both sides of the reels, a fire burns constantly, lighting up the hieroglyphics on the pillars in the background. Luxurious drapery frames the reels and the entrance of the tomb, signalling the importance of the persons that lie buried here. The reels are beautifully framed in gold and rich jewels, again giving the slot a regal and dignified look to it. The soundtrack for Egyptian Stone is very entertaining to listen to and completely inspired by Ancient Egyptian music; drums, chanting, gongs, and chimes along with other instruments create a beautiful mix of sounds that immerse you into the theme. Underneath the reels, you can find the game panel which is designed to blend in with the blue and gold colour scheme of the game. Here, you can adjust your bet, activate the Max Bet option, the Autoplay option, and spin the reels. Above the reels you can find a Turbo Mode setting and access to the paytable. Egyptian Stone from Spinmatic is a valuable addition to the Ancient Egyptian themed slots out there, setting itself apart with impeccable graphics, a great soundtrack, and an extra special free spins feature. You also have the chance to gamble your winnings in an interactive feature if you want to and prizes can go up to 500x your bet in the base game! Check out this Ancient Egyptian inspired gem here at Videoslots today! Another reason for their success is that they’ve set their own standards high with their magnificaent release, such as Roboland and Caishen's Treasure. All the games that followed have been consistently high quality, brilliantly designed, and featuring out-of-the-box themes and gameplay.